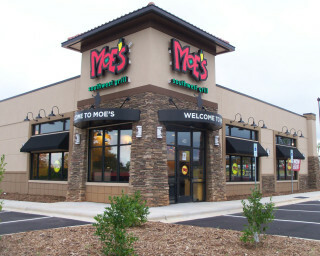 This site is located at a prime location in a heavily developed commercial district at an interchange with I-77 in Mooresville, NC. The site had remained undeveloped for many years due to several issues, including geotechnical, environmental, and restrictive land use concerns. BRE was selected by the developer and was challenged to plan and permit a commercial center with a tight budget and aggressive schedule. BRE researched historical documents and assisted our client with establishing vested rights which had a significant impact on development of the site impervious areas and traffic. BRE performed an inspection of the large diameter storm drainage pipes at the site which convey storm water through the site from a large commercially developed drainage area outside of the project limits. BRE identified several issues during the due diligence phase which were required to be resolved prior to closing of the real estate purchase. There were numerous cross access agreements, covenants and restrictions which were examined and modified as necessary for development of the project. BRE provided legal exhibits and assisted real estate attorneys with identifying issues and preparation of legal descriptions. Multiple concept plans were prepared to maximize return on investment for development of the property. 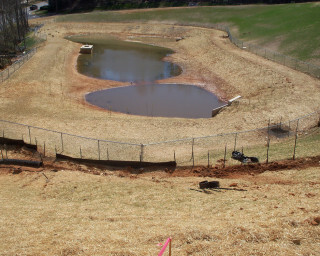 One of the challenges of this project was the decision to relocate of a regional stormwater pond. The project schedule dictated that the grading of the first building pad had to be completed within 15 days of the start of construction. Development plans had to be coordinated to maintain access and utility service to several existing businesses surrounding the site. The site was under a Notice of Violation. Blue Ridge Engineering (BRE) worked with the North Carolina Department of Environment and Natural Resources (NCDENR) to obtain a No Further Action letter to resolve the regulatory issues associated with the site. Coal ash had been placed as structural fill at the site in the past. BRE conducted environmental assessment activities and assisted with negotiation of a brownfields agreement with NCDENR for redevelopment of the site. BRE conducted subsurface exploration and prepared a geotechnical report. Approximately 400,000 cubic yards of coal ash had been previously placed as fill at the site. The fill depth was as much as 40 feet. Samples were taken and consolidation testing was performed to estimate anticipated settlement of the deep fill. BRE performed a boundary and location survey in conformance with ALTA standards and assisted with title research. The project required two separate subdivision plats and multiple as-built surveys at different stages of construction. 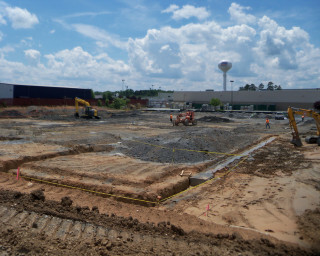 BRE provided all layout control and construction staking for multiple contractors on site. Building finished floor elevations were adjusted to balance earthwork on the site. The cost of site retaining walls as well as building foundation walls was evaluated to maximize the gross floor area developed on site. BRE designed the site layout, grading, storm drainage, detention pond, water, sewer, erosion control and landscaping for the development. BRE obtained all permits required from state and local authorities having jurisdiction. BRE prepared construction contract documents and assisted our client with obtaining construction bids, evaluating bids received and negotiating an acceptable contract. 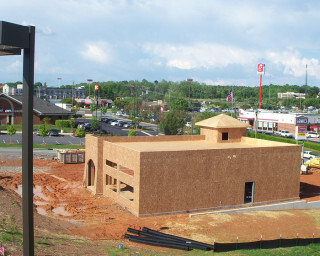 BRE provided cost estimates, cost alternatives, and other construction administration services. BRE monitored all sitework activities and performed special inspections for building construction including concrete testing, steel inspection, and floor flatness testing. BRE monitored foundations to confirm anticipated settlement was within the specified range identified in the geotechnical report prepared for the project. 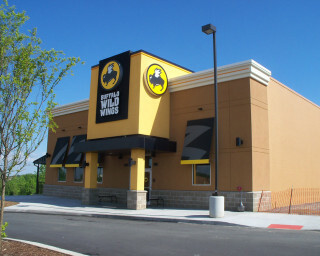 Tenants located on the site include Hobby Lobby, Buffalo Wild Wings and Moe's Southwest Grill. We are honored to have been selected to provide our services for this very successful commercial land development project.